Vimeo iPhone App – What is it? The Vimeo app is a nice feature-rich iPhone app that ties up well with the Vimeo video uploading and sharing site. Creating an account on Vimeo.com is a requirement before you can use the app. Once you've got that settled, you can enjoy all the good features of the app such as uploading videos, managing your video collection, sharing your videos and editing your videos as well. Once you've downloaded Vimeo on your iPhone and you've registered for an account or logged in to your existing account, you'll see the app's main menu with the five tabs available for you to use. These tabs include – My Videos, Recordings, My Stuff, Browse, and Account. The My Videos tab lets you select or shoot videos and upload them to your Vimeo account. Here you can select whether to shoot High Definition, Standard or Low quality video. The app allows you to pause and resume the upload process, and you can edit and delete uploads from this tab any time you want to. My Stuff tab contains new videos waiting for you to watch, videos that you have found on Vimeo which you have saved, as well as videos you have "liked" on Vimeo. The Browse tab displays the Vimeo video timeline and is where you can watch videos uploaded and share by other Vimeo users. To aid you in browsing videos, the Vimeo app has categorized these videos into various categories. While this is a good way of browsing videos on Vimeo, it would have been better to have a facility to search videos based on keywords. Hopefully, this feature will be added in the next update of the app. The Accounts tab gives you access to various bits of information about your Vimeo accounts and activities. You can view your usage patterns as well as the number of times your videos have been played and watched. We intentionally skipped discussing the Recordings tab so far since we want to highlight this feature. 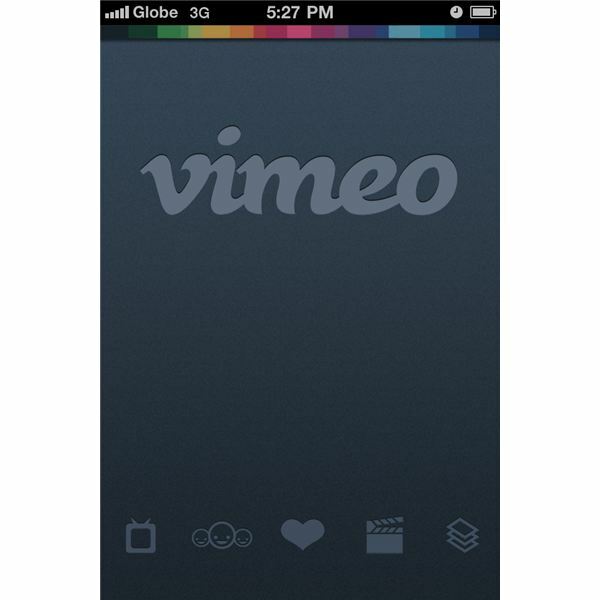 This tab makes the Vimeo app for iPhone not just a video uploading and sharing app like YouTube's iPhone app but more like a fully-functional video editor like iMovie for iPhone. Vimeo lets you create a video project either from videos you've recorded using your iPhone at the moment or previous videos you've saved on your iPhone. From here, you can edit titles and add some more stuff such as movie clips, text captions, transition effects, sounds, volume and more. You can also add more video clips or even photos to your video project. Once you're done with your video project you can then save it and have the render uploaded to Vimeo via the app. The video editor function may seem difficult to use at first, similar to iMovie. But once you get the hang of it, you might use it more often to create video for sharing. As it is right now, Vimeo is a pretty good video app for iPhone. Not only does it address your video uploading and sharing needs but video creation and editing as well. The app works well with some minor hitches along the way, specifically when uploading videos to Vimeo. Make sure that when uploading your videos, you select the correct video quality or else it might take longer for the app to successfully upload your video. Overall, it's good to have another video uploading and sharing giant such as Vimeo on the iPhone. In case you're not aware, the Vimeo site has a great collection of good quality and high definition videos which you can watch with pleasure any time, anywhere – for as long as your iPhone is connected online – via Wi-Fi or 3G. We're really looking forward to future updates of the Vimeo iPhone app. Image credit: Screenshots courtesy of the author.